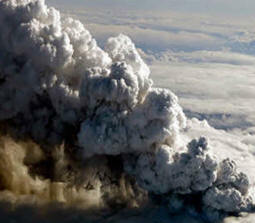 May 24, 2011 - The UK Civil Aviation Authority said that new arrangements put in place since last year’s volcanic ash cloud would ensure high levels of public safety while helping to limit any disruption in the event that volcanic ash reaches UK airspace this week. But the CAA warned that disruption to aviation couldn’t be ruled out. The current weather outlook suggests that there is the possibility of ash reaching Scottish airspace from Tuesday onwards, and affecting other parts of the UK and Ireland later in the week. The CAA is actively monitoring the situation and is in close touch with the Met Office, Department for Transport, airlines and airports and NATS, the UK air traffic services provider. The impact of volcanic ash on aviation would depend on weather patterns, and the nature and density of ash present in the airspace. • Any UK airline wishing to operate in areas of medium or high density ash, will need to have a safety case accepted by the CAA. Many airlines already have such safety cases in place and agreed for medium density. None has so far submitted a safety case to operate in high density ash. • A safety case sets out the measures airlines will put in place to mitigate the risk of flying through ash. They also include input from aircraft and engine manufacturers. Safety cases have been used by airlines for many years to set out how they will safely deal with other unusual or challenging issues. • The CAA is the UK's specialist aviation regulator. Its activities include: making sure that the aviation industry meets the highest technical and operational safety standards; preventing holidaymakers from being stranded abroad or losing money because of tour operator insolvency; planning and regulating all UK airspace; and regulating airports, air traffic services and airlines and providing advice on aviation policy from an economic standpoint. • The three levels of ash density are defined as: Area of Low Contamination: An airspace of defined dimensions where volcanic ash may be encountered at concentrations equal to or less than 2x10-3 g/m3, but greater than 2x10-4 g/m3. Area of Medium Contamination: An airspace of defined dimensions where volcanic ash may be encountered at concentrations greater than 2x10-3 g/m3, but less than 4x10-3 g/m3. Area of High Contamination: An airspace of defined dimensions where volcanic ash may be encountered at concentrations equal to or greater than 4x10-3 g/m3, or areas of contaminated airspace where no ash concentration guidance is available.